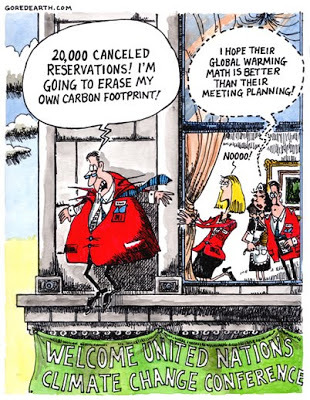 Over 20,000 hotel reservations have already been canceled for the upcoming Climate-Scamapalooza conference in Copenhagen this November! This news comes at a time when the vast majority of the public have become more skeptical of global warming fears, joining the tens of thousands of worldwide scientists who have spoken out against prophet profiteer Al Gore’s religion while proving over and over that increased CO2 in the biosphere has huge benefits for all life, and of course the nagging fact that the Earth has still failed to actually warm up. In fact, it’s still cooling and is estimated to continue cooling for the next 20-30 years. Well well well, sanity just might prevail in the face of all these facts. Thomas Færgeman, the director of environmental think tank Concito, was concerned the government “had lost confidence that it could broker a ground-breaking climate and had therefore lowered expectations as to how many participants were expected”. Aww what a shame. The timing couldn’t be better, as the upcoming October release of Not Evil Just Wrong will also make an impact on the UN’s agendas at Copenhagen. Not to mention an impact on Greenpeace’s propaganda and their coffers.